As you know, there’s a general election on the way. Who, though, would ever have expected the Hayward Gallery to mount an event in February that is already billing itself as part of the build-up? History Is Now is, according to its paperwork, “both a reminder of the recent past and a platform for considering the future”. Having seen it, I wouldn’t go that far. Lots of things here don’t work. But some do. And the big ambition — to use contemporary art to lecture us on the state of the nation — is a praiseworthy one. We’re about to hear from everyone else. Why not hear from the artists first? Seven of them have been asked to curate a display, a show within a show, focusing on different aspects of Britain’s postwar history. We begin marvellously with Simon Fujiwara’s encapsulation of the switch that commenced in the 1980s from real Britain to virtual Britain, or, as he prefers to put it, from “material to immaterial production”. In a nutshell, from a society that dug coal out of the ground to one that exists on an iCloud somewhere out there in the ether. It’s a difference made vivid by his opening visual comparison. On the left, a huge lump of coal, half a tonne in weight, excavated at one of Britain’s last working coal mines, at Swadlincote, in Derbyshire. On the right, the costume worn by Meryl Streep in her Oscar-winning performance as the Iron Lady. The coal is real. Meryl Streep and her power suit were not. By magic-carpeting our imaginations back to the miners’ strikes, and to Margaret Thatcher’s impact on postwar British history, Fujiwara is cleverly triggering an understanding of our recent past as a journey from the tangible to the imaginary. All this is laid out on neat plinths like evidence at a trial. As you wander through, your thoughts are nudged this way and that by a sneaky range of exhibits. See those two black rubbish bags that seem to be saying something telling about our disposable society? They’re not rubbish bags. One is a painted bronze by Gavin Turk, made to look like a rubbish bag. The other is a sculpture by Ceal Floyer, created with black plastic and air. What’s good here is the way Fujiwara makes his arguments visually. The black rubbish bags rhyme with the big lump of coal. The lump of coal rhymes with Margaret Thatcher’s black power suit. While at the far end of the display, at its culmination, a sculpture by Matthew Darbyshire, called Furniture Island, confronts us with an elegant modern living room of the kind you see in today’s lifestyle supplements — lamp, table, trainers — all coloured a deep and fashionable black. Unfortunately, this fine opening turns out to be one of the show’s two high points. The next section, selected by Jane and Louise Wilson, is the first of the lows. Focusing glumly on the impact of architecture on Britain’s social order, it is dominated by huge photographs of women storming the fences at Greenham Common, and generally remains bleak and preachy. Richard Hamilton’s eerie 1993 diptych The State, with a patrolling British soldier in one panel and an empty street in Northern Ireland in the other, is, however, a rare example of a modern history painting that successfully encapsulates the mood of its times. And the gloomy cage nearby, filled with hanging gloves by Stuart Brisley, remembers, so atmospherically, the terrible unemployment figures of the year it was made — 1983. All seven selecting artists are clearly Tory voters who support the coalition. Only kidding. All of them are clearly not Tory voters, and if this really were part of the election build-up, it would definitely fail the impartiality test. A truer way to see the show is to view it as a reheat of British art of the 1970s and 1980s. Those of us who remember well those terrible days of dreary agitprop and interminable artist’s films are treated here to a testing replay. The next three sections are the show’s worst. Hannah Starkey gives us a roomful of photographs from the Arts Council collection, dating mostly from the 1970s. Bleak in mood, black and white in tone, A4 in size, this is photography as the art form of the unhappy. Roger Hiorns’s selection, focusing solely on the story of mad-cow disease, consists mainly of scientific data and policy reports. If your idea of artistic pleasure is to read letters from the council, this is the selection for you. Upstairs, John Akomfrah treats us to an outrageous stack of flickery 1970s films in which no one is in focus and everyone gets their kit off. It’s outrageous because seeing all these films from beginning to end would take about nine hours. Who in modern Britain has that kind of time on their hands? So it’s left to the veteran sculptor Richard Wentworth to provide the event with its second highlight and a marvellous ending. 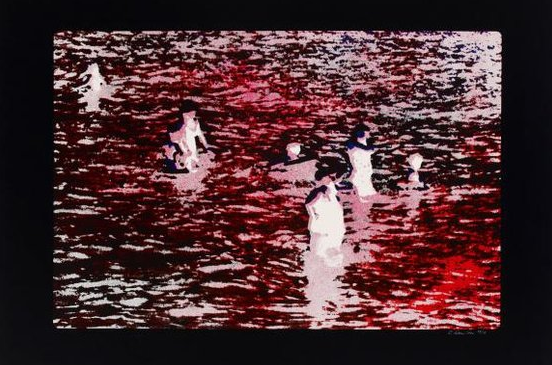 Just as Fujiwara did before him, Wentworth combines telling artworks with telling objects as he sets about trying to encapsulate the mood and meaning of Britain after the war. His specific focus is the British coast, which he probes and plays with in a refreshingly uplifting fashion. If you’ve poked about in a rock pool, you’ll know the mood. The thing about the British coast is that it was both a barrier to invasion and an artistic playground. Paul Nash’s great wartime view of a big coastal sky crisscrossed by vapour trails records a moment of unexpected poetry in an epoch of destruction. Down on the beach itself, meanwhile, Henry Moore and Barbara Hepworth were collecting the pebbles whose ancient roundnesses would so powerfully influence their own work. 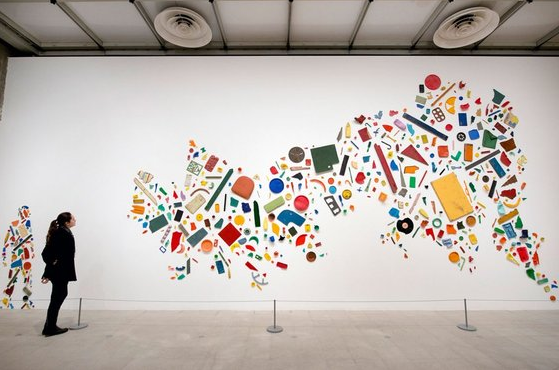 This idea that stuff washed up on the beach can be reused to make modern sculpture was updated brilliantly by Tony Cragg in 1981 when he made Britain Seen from the North, a monumental wall-map of the nation, made entirely of washed-up plastics. I’m not sure whether Wentworth has tried deliberately to make the point that ignoble things can achieve a noble beauty, but I must say, even the surface-to-air missile parked so unexpectedly on the Hayward terrace was a thrilling sculptural sight. That, then, is the History Is Now sandwich: a superb beginning, a superb ending, with an indigestible middle.